Last Tuesday night The Recipe Trial Club gathered at KLB headquarters to be my guinea pigs; only, in a good way. The Recipe Trial Club is made up of myself, Mattie Hagedorn, Dawne Eng and Terry Hope Romero. The four of us have been getting together once a month to help each other test-run and taste-test recipes. This month, my vegan foodie partners in crime gave me feedback on a new seasonal Sweeties cupcake recipe: Spiced Pumpkin with Maple Bourbon Buttercream Frosting (pictured above). Each Recipe Trial Club gathering has been a great night filled with good food, good company and good conversation. Last week's gathering was no exception. We ate, drank wine and chewed the fat about eating locally, the science of vegan baking, and Mattie's totally unique homemade herbal remedy for ADD, among other things. On the food front Terry made us an awesome salad, and I'll share the recipe with you in a moment. But the best part? Was towards the end of the evening when we devoured the cupcakes. Spiced Pumpkin Sweeties with Maple Bourbon Buttercream Frosting were a hit. And I was so happy with the way the recipe turned out, I made another batch to feed to another small group of guests over the weekend. Below are a couple of quick snapshots of — what else — the RTC meeting food table. And since Terry's salad really was incredibly delicious, I wanted to share the recipe with you, reprinted from Veganomicon with permission from Terry. The creamy, garlicky salad that eats like a meal. Ground almonds provide a texture similar to grated hard cheese and capers bring on an essential briny flavor. The fresh, homemade croutons bathed in roasted garlic and olive oil really make it so don’t substitute lame store-bought ones. Be generous with the salad dressing, as this recipe makes a lot. Adding a little spinach and arugala really fortifies this salad, but you can leave it out if you like. 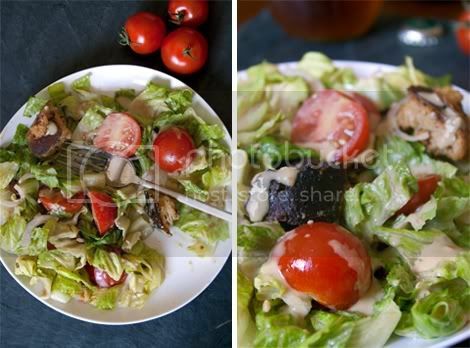 Make an entrée out of this Caesar salad and serve with marinated, grilled tempeh or tofu and grilled mushrooms, asparagus and leeks. To start: Wash and dry lettuce and if using, other salad greens. Place in zip-top bags and store in refrigerator to keep crisp and cool. Make the dressing first: with a food processor pulse the sliced almonds till crumbly. Empty ground almonds into an air tight container that you’ll be using to store the finished dressing in. To food processor bowl add garlic, tofu and oil and blend till creamy. Add lemon juice, capers, caper brine, sugar, dry mustard powder and pulse till blended in. Taste and add salt to taste and adjust flavor with more lemon juice if desired. Pour into container with the ground almonds in it and whisk to combine. Cover and allow dressing to chill in the refrigerator for a minimum 30 minutes, optimally 1-1 1/2 hours. While dressing is chilling prepare croutons. Preheat oven to 400 degrees. In a large bowl combine olive oil, roasted garlic and lemon juice. With a fork or immersion blender mash or blend the roasted garlic till creamy. Add torn bread and toss to coat each piece with the garlic/oil mixture. Spread onto a rimmed baking sheet, sprinkle with a little salt if desired and bake for 12-14 minutes till golden brown. Stir the croutons a few times during baking. Allow croutons to cool on baking sheet. To assemble salad: Pour 2-3 cups for each individual serving (depending if it's a side or entree) of lettuce/greens, and if using vegetables, tempeh, etc. into a large bowl. Ladle on about 1/3 cup dressing (or more or less to taste), and use kitchen tongs to toss greens and coat greens. Add warm croutons as desired, toss again and move to serving plate. Sprinkle with a little freshly cracked pepper if desired. If not serving right away, warm croutons in 300 degree oven for 5-8 minutes before adding to salad. Makes 4-5 side servings or 2-3 generous entrée servings. For more about Terry and her recipes, visit veganlatina.com. 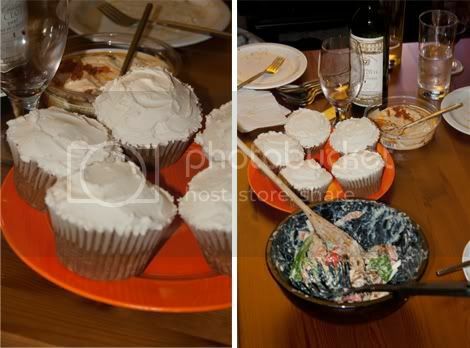 Ahh, the cupcakes..and that salad! 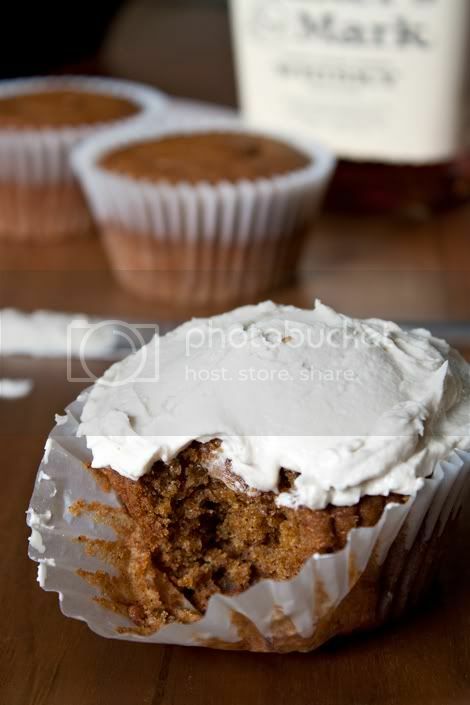 Deliciousness all around, and the Spiced Pumpkin cupcakes are going to be a great addition to your cupcake arsenal!